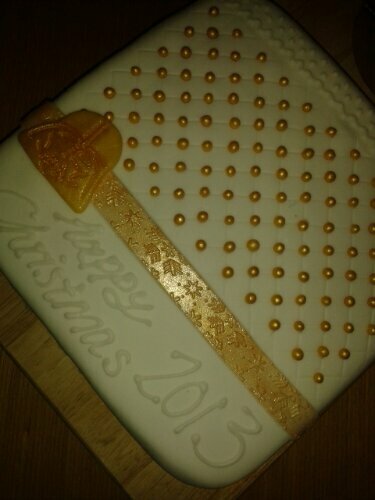 Inspiration needed for a baker with no artistic talent, who needs to decorate a Christmas cake. After finally making my Christmas cake and feeding it with a lot of alcohol in a short period of time, I’m now stuck with the dilemma of how to decorate it. Last year was quite easy as I had been to a cake decorating course and we made our decoration ready to put on; unfortunately, this year I’m on my own. I have basic skills with regard to my artistic talents. You know those people who say they aren’t very good at drawing but are actually fantastic? Yep? … well, I’m not one of them. I’m in the realm of making snowmen, penguins and anything else that a 5 year old can design. I do have a skill of being able to ice a cake extremely quickly and quite well (I was the fastest in our class!) but I’m not sure what to put on it. I have gel colours, glitter, shapes, cutters, modelling tools, and my new addition of silver spray… all I need are some ideas. I’m very late in starting my Christmas cake this year as usually Halloween signals the start time, but I thought its better late than never. Unfortunately my first attempt only managed to get half way through before it ended up in the bin due to a catalog of errors leading to its eventual demise! I knew it was going to go wrong from the start when I bought the wrong eggs. Now they weren’t wrong as in quails eggs instead of hens, but what I had bought was eggs from caged birds instead of free range ones by accident. Although this probably wouldn’t bother many people, it really bothers me and makes me feel guilty. Next I forgot to buy butter so with a very unhappy baby screaming very loudly in the car, my husband had to nip into the shop to buy my butter on the way back from the supermarket. Still, not to be deterred I plodded on with my cake recipe but I only got as far as creaming the butter and sugar together when I thought the mixture might not have been right as it didn’t look smooth. Turns out I’d not used fine brown sugar! Although this was frustrating I thought it might have been ok to carry on till I made one fatal error – I dropped half an egg shell into the mixture. So I decided it had all gone far too wrong and bagged and banned it. Tomorrow I will try again and hopefully this time it’ll go right, because no one wants a bad Christmas cake with egg shell in it.